Recently I was copying an article from MS Word to WordPress post editor. I noticed that only text was being coping and not the images. The text was also losing simple formatting like bold and italic text. I searched internet for a solution and tried a lot of things but nothing worked. There are some some plugins available for doing the job but they are either paid or they need to be kept forever in order to preserve the formatting and images of MS Word content on your blog. My website already had a lot of plugins and I didn’t want to add more junk, especially for simple tasks like this. So I just experimented with a few things and finally something worked. The solution to the problem was using Google Docs and a little Google Chrome Extension. Instead of copy pasting directly from Microsoft Word to WordPress we will use Google Docs as a buffer. 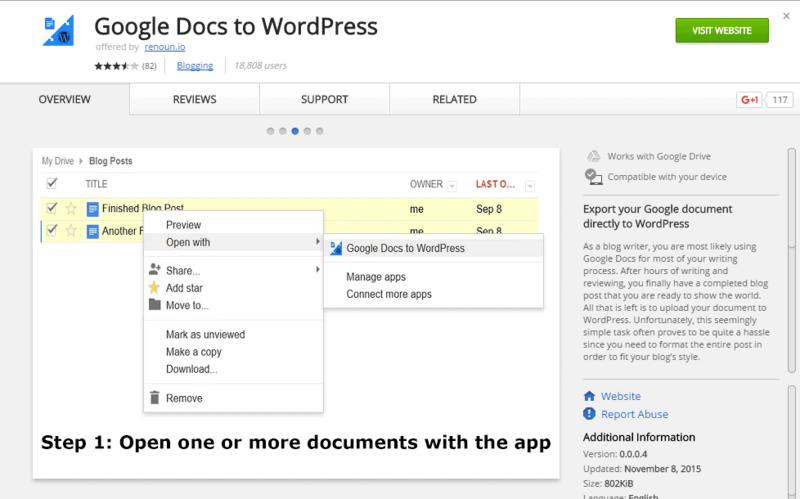 The Chrome Extension Google Docs to WordPress will integrate Google Docs and WordPress. Follow the following steps to copy paste the content from Word to WordPress without losing any formatting or images. Upload your Word File to Google Drive. As soon as the files opens Google Docs will create a new file with the same name in Google Docs format. You will see that the icons of Word format and Docs format are different. Now you can close this file. Right Click on the Google Docs File and Select ‘Open with’ -> Google Docs to WordPress. it will ask for your WordPress credentials to connect. then the extension will move all the content to WordPress and create a post in draft. Now you can go to your WordPress dashboard, edit this draft post and publish. वर्डप्रेस का तो अनुभव कम है, परंतु ब्लॉगर ब्लॉग के लिए अभी मैं ओपन लाइव राइटर इस्तेमाल करता हूँ. यह एमएस वर्ड के फालतू के टैग्स को हटा देता है , एचटीएमएल को क्लीन कर देता है, और जरूरी फार्मेटिंग जैसे कि हेडिंग, बोल्ड इटैलिक्स आदि को बरकरार रखता है. एक बार आजमा कर देखें, यदि कोई ब्लॉग क्लाएंट उपयोग करना चाहें तो. मैं इसे पिछले कोई आठ-दस साल से उपयोग कर रहा हूँ (पहले यह विंडोज लाइव राइटर था), और यह मेरी ब्लॉगिंग के लिए जरूरी साधन है. बहुत से काम आसान हो जाते हैं और उत्पादकता भी बढ़ती है. अब तो इसमें हिंदी का वर्तनी जांच अंतर्निर्मित आता है, और अच्छा है. इस जानकारी के लिए बहुत-बहुत धन्यवाद रवि सर. मैं भी आजमा कर देखूँगा.